In 1991, I invented the concept of infusing fertilizers and soils with beneficial soil microbes and mycorrhizae, utilizing “Nature’s Intelligence©.” My Dr. Earth® products with ProBiotic™ revolutionized the lawn and garden industry and changed expectations of customers. Now other companies, with the best of intentions, sell products believed to include living organisms. However, my continuing scientific research has revealed serious discrepancies between laboratory conditions and conditions typically found in nursery or garden center environments, conditions that can render ineffective, the microbe-infused products of all well-meaning soil bagger. After years of research I discovered a solution to the problem. Now my patented invention, Pro-Moisture Hydrate®, is included in every Dr. Earth® branded soil. But in the case of all other brands who have copied the use of beneficial organisms, the effectiveness of their products remains at serious risk, if it exists at all, as I will presently explain. Beneficial microbes are cultured in a clean laboratory environment―with a stable and moderate temperature―for use in such products as yogurt, nutritional supplements, animal feed, beer, or packaged soil. I was the first to include living organisms in DRY organic fertilizers, and there was no problem with viability. But soon everyone wanted this biology in BOTH dry fertilizers and WET bagged soils. After packaging, these WET soils are shipped from the manufacturer into the real world and are no longer in a controlled situation favorable to living microbes. When soil baggers ship their products to retail markets, the biology contained in the packages faces the harsh conditions of the real world: extreme heat and cold. In 2004, one of my customers questioned how microbes could survive in the bags in his hot parking lot. I replied that they could because they were in a dormant state. The original Dr. Earth® microbe-infused products, the first ever available, were dry fertilizers in which microbes survived regardless of temperature extremes. Ongoing random tests proved their sustained viability. However, no one in the industry realized at the time, that adding them to WET soils created completely different, and fatal, circumstances for these tiny life forms. I considered the customer’s question carefully and grew concerned. I could not, with a clear conscience, sell products claiming to contain live organisms if I wasn’t sure of the truth of that claim. I purchased my own soil from a Los Angeles nursery, where it sat in full sun, and had it tested. Two weeks later I received the bad news; all the microbes were dead. I tested other brands that had begun adding microbes and mycorrhizae, stored under the same conditions, and saw the same results. The organisms were dying within 30 to 60 days after packaging. The temperature of bagged soils stored outside on pallets, in direct sun, can reach 175°F, killing beneficial microbes just as cooking our food kills those that could harm us. Conversely, exposure to freezing kills them too. Microbes infused into WET soils break dormancy and come to life. They are full of water, actively multiplying and digesting organic materials. When frozen, these organisms swell―since water expands when it freezes―causing their cell walls to crack open. They rupture, and DIE. Other soil producers, who embraced this profitable response to consumer demand for microbe-infused soils, still live with the problems my research revealed. They continue to sell products of questionable value while I have perfected my invention. For years, the answer to the problem had been right in my own home and part of my everyday life: ALOE VERA. This desert plant, used by early civilizations, thrives where temperatures reach as high as 140°F during the day and below freezing at night. Aloe vera works like a natural “anti-freeze.” It draws water from the surrounding environment and reduces “evapo-respiration.” Just as it protects plants, aloe vera keeps microbes moist and alive in extreme heat or cold, and elastic enough to survive the expansion that occurs with freezing, so they can swell without bursting and dying. What aloe vera does for your human skin and hair, it also does for living micro-organisms when incorporated into our wet packaged soils. It coats and protects them, remains in contact, and by lowering the surface tension of water, aloe vera serves to transport synergistic elements, such as moisturizing acids, through the cell walls to penetrate deeply. This is why I formulated, and patented (Serial No. 12,803,002) Dr. Earth Pro-Moisture Hydrate® with aloe vera. 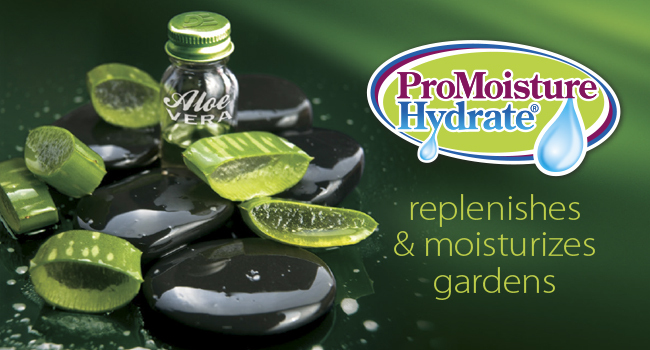 I needed permission from the Department of Agriculture to include Pro-Moisture Hydrate® with aloe vera in my soils, but the USDA did not recognize aloe vera as a soil ingredient. I carried out extensive research between April 2005 and September 2008 and prepared a field trial and efficacy report. Results in our test gardens, comparing plants grown in our soils with and without Pro-Moisture Hydrate®, proved conclusively that Pro-Moisture Hydrate® increases plant yields, vigor, and color penetration. With a patent and the Department of Agriculture approval, Dr.Earth® was prepared to offer the only packaged soil in America that protects beneficial microbes. PRO-MOISTURE HYDRATE® is found ONLY in Dr. Earth® soils. Note: The aloe vera plant, a succulent, has fleshy leaves with a tough outer skin, under which is a resinous, extremely bitter tasting, yellow substance.